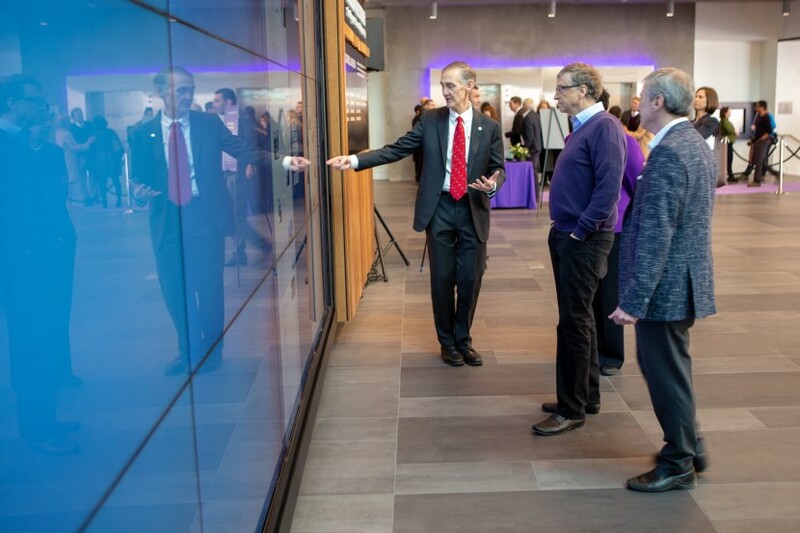 Belle & Wissell’s new interactive media experience—the Tribute Wall, located at UW’s Paul G. Allen School of Computer Science & Engineering—invites the next generation of innovators to the new Bill & Melinda Gates Center. The video wall’s distinct ambient and story modes welcome visitors of all ages and interests. The Tribute Wall’s abstract visualizations provide a tranquil, yet active, backdrop for the Center’s bustling foyer. 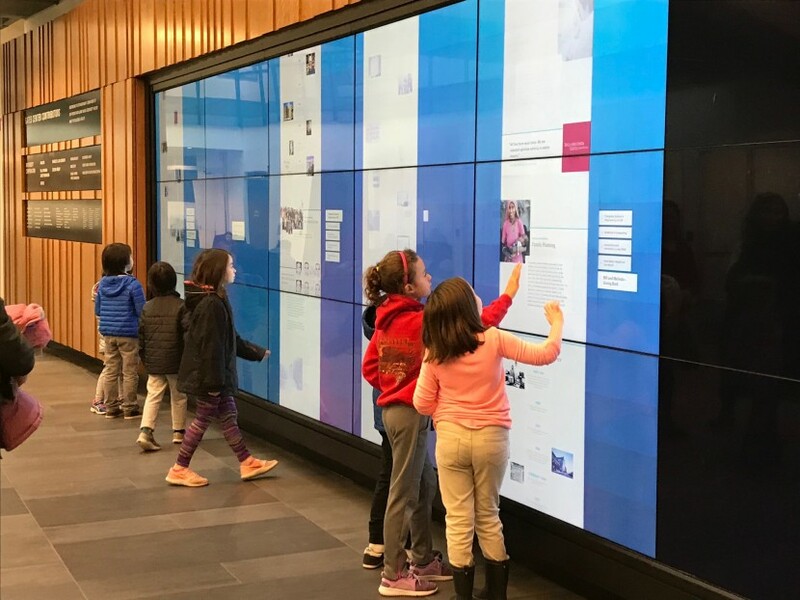 When a visitor approaches, story cards (prompted by embedded motion sensors) automatically appear, offering engaging narratives with the tap of a finger. Visitors can explore a vast selection of stories pertaining to Computer Science & Engineering (CSE), sorted into five themes: CSE at the University of Washington, Diversity in the field, Innovation in the Pacific Northwest, and the accomplishments of Bill & Melinda Gates and Paul G. Allen. These final two topics trace a familiar Pacific Northwest history. Though it was founded in Albuquerque, Microsoft was born and built in Seattle. Bill and Paul first met at the Lakeside School Programmers Club, where the boys—then age 14 and 16—bonded over a love of computing. With help from the Lakeside Mothers’ Club, the students purchased a Teletype Model 33 and access to a GE timesharing computer. These early experiences laid the foundation for Bill and Paul’s decades-long collaboration. Listen to an excerpt from Bill Gates’ remarks here. 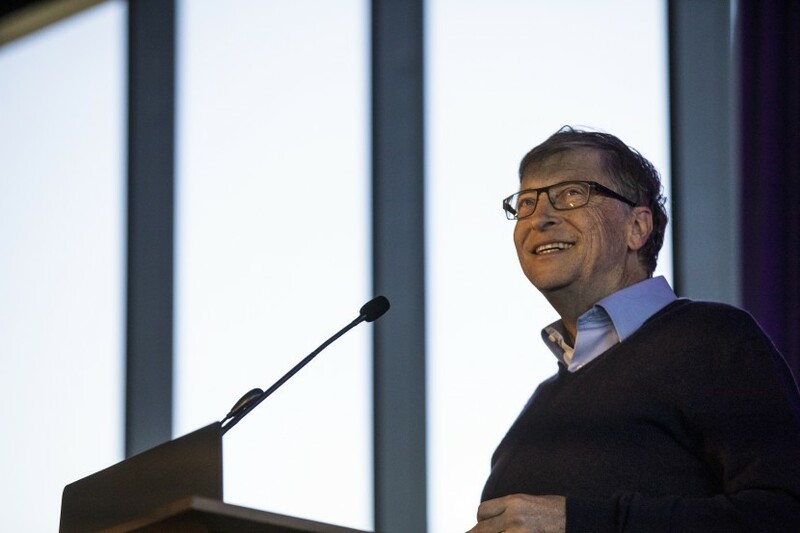 The Bill & Melinda Gates Center was made possible by a group of local philanthropists and early Microsoft employees, affectionately dubbed the “Friends of Bill & Melinda.” Their investment will help the Allen School continue its work furthering diversity in the field. Already the Allen School is a leader among universities, with twice the national average of women graduates in CSE. Outreach to K–12 students, programs for disabled, Eyes-Free, and hard-of-hearing or Deaf communities, and women’s mentorship groups are some of the ways the Allen School is building a more representative field. Belle & Wissell built a CMS to allow for easy updating and additions to Tribute Wall content. Stories refresh every quarter, including news from the Allen School on the undergraduate community, award winners, and new research from graduate students and faculty.